Tax time is quickly approaching and regardless of whether you use an accountant, a friend, or one of those programs that allow you to do free taxes, that still means going through receipts looking for those deductions. One particular deduction that I have never taken is vehicle mileage. The reason I haven’t taken it is because I am terrible at keeping records. I tried the paper vehicle mileage logbook and writing down my start and end mileage but that just didn’t work out. So today I’m looking at Miles for iOS, Miles is a vehicle mileage logbook which aims to help you track and document your mileage. 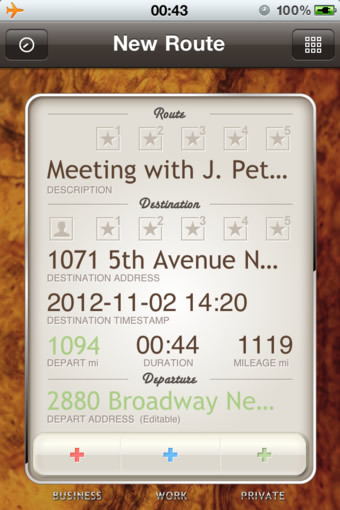 Miles has a gorgeous interface and is very easy to use. As I said above the interface on the main screen gorgeous and very easy to read. 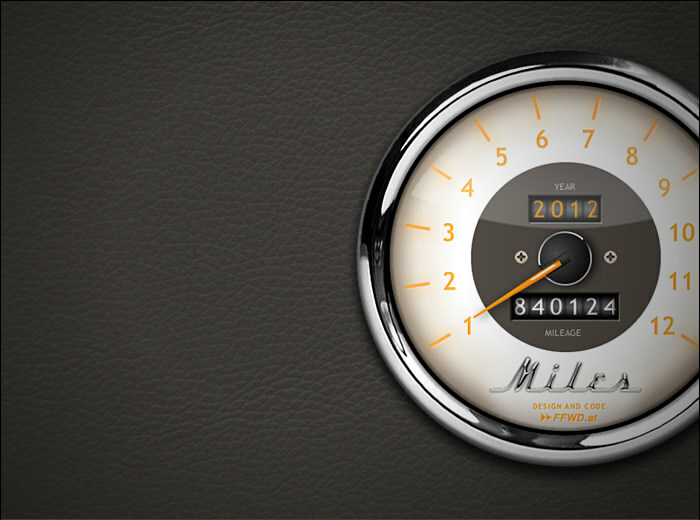 It features a dial which has your current mileage, the year, and the month. Logging a trip is simple and can be sped up using several presets which you can set for frequently used destinations. Route Definition: I used this as a general description such as “Site Visit”. There are 5 presets available to store frequently used routes. Destination: This can be an exact address or just a name. I put the name of my client in this field. There are 5 presets here and you can also access your contact list and choose an address. Destination TimeStamp: This is the date your arrived at your destination. 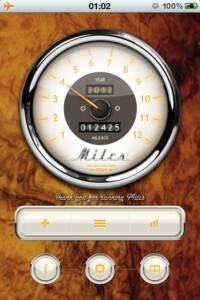 Starting Mileage: Once you have been using the app it will prefill this value from your last ending mileage. Duration: How long the trip lasted. One nice feature is that if you make a mistake and put a duration which is far too short for the mileage driven then Miles will warn you. Ending Mileage: Mileage at the end of your trip. Depart Address: Where you left from. I used “Home” or “Work” but you can put an address in if you like. At this point you add the entry by choosing the Business, Work, or Personal buttons. Very simple and the front screen is then updated with your current mileage. From the front screen you can view your vehicle log and email the logbook in pdf format. In theory, a mobile vehicle mileage logbook is a good idea but for it to be practical it must be quick and easy. I found Miles to be very easy and I was able to make entries easily. It did take a few minutes for me to get used to the interface and the fields I needed to enter but after a few minutes and by using presets I was able to make an entry in less than 20 seconds. Considering the tax benefit, I think 20 seconds is certainly worth it. Miles is an app that looks great and is easy to use. The potential savings far outweigh the cost so it’s worth a look.